This is one of my favourite! Spicy chicken drummettes with hints of smoky citrus and cilantro, topped with crumbled feta cheese. The spiciness is moderate and I like the smoky citrus taste that makes it very appetizing and addictive. It’s a great starter for anytime of the day. How to resist this crunchy chicken drummettes tossed in chile-garlic sauce, resting on creamy avocado crema, sprinkled crumbled feta cheese and fresh cilantro. It’s a creamy crispy kind of fried chicken. Now it’s dinner time! 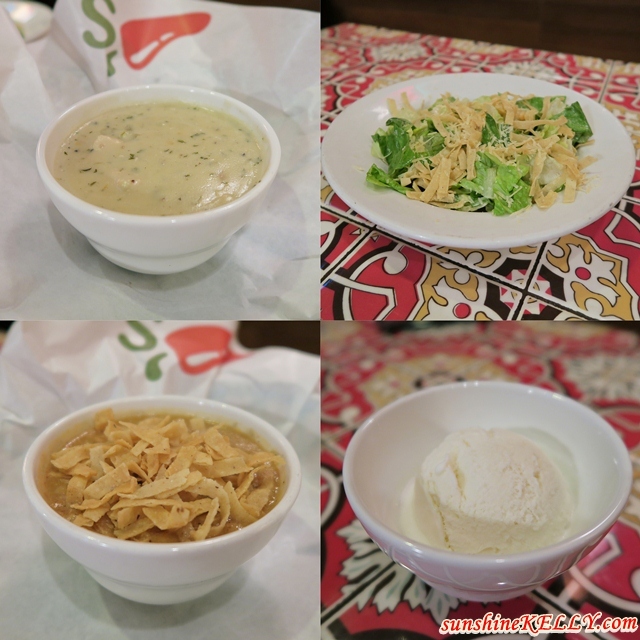 The new DINNER SPECIAL sets at Chili’s are really fun and fulfilling because at just RM35.95, RM 40.95 or RM43.95, you get to choose a soup or salad, delectable main course and end your meal with a scoop of vanilla ice cream. The Dinner Special is only available after 6pm and from 27th May till 22nd July, 2017. Crispy chicken breast hand-battered and fried to perfection, served with mashed potatoes with creamy black pepper gravy and sweet corn on the cob. The juicy and crispy fried chicken goes so well with Chili’s mashed potatoes and hint of spiciness from the black pepper gravy. Easy peasy crispy chicken tossed in spicy buffalo wing sauce with beef bacon, bleu cheese crumbles, house-made pico de gallo, crispy tortilla strips served with house-made ranch dressing on a bed of greens. Quesadillas is great for sharing too! Marinated chicken and beef with grilled onions and Jack cheese in tortillas, served with sour cream and house-made pico de gallo. Hand-seasoned beef patty topped with Pepper Jack cheese, beef bacon, onion rings, leaf lettuce, tomato, mango-infused BBQ sauce & Chili’s Signature sauce. Served with house-made garlic dill pickles, homestyle fries and a side of mango-infused BBQ sauce. One of my favourite tex-mex dish! This marinated grilled prawns, corn and black bean salsa, rice & chipotle pesto and topped with cheddar cheese, house-made pico de gallo, fresh ﬁeld greens, chopped cilantro, crispy tortilla strips, fresh sliced avocado & a drizzle of cumin-lime sour cream. The whole combinations is very balance, not too heavy and refreshing. If you are a lamb lovers like me, this is worth it. A slab of thick lamb with Chili’s special marinade grilled to perfection and served with mashed potatoes with black pepper gravy and seasonal veggies. Overall, we had a fun get together and dining experience at Chili’s Empire Subang Shopping Mall. The portions served are satisfying and fulfilling. There are more Dinner Special combos varieties that you can choose from apart from here. Kindly take note that that the SOCIALS and DINNER SPECIAL are available for a limited time only from 27th May till 22nd July, 2017. I haven't been to Chilis for quite some time. It's a good place for gathering with friends. I've not been to Chili's before because they don't have an outlet in Ipoh. Looking at your photos of such a delicious meal, it is high time I made the effort to go either in KL or Penang. Great deals, I love going to Chilis with the new combos available I'm definitely stopping by this weekend. The price is ok no to expensive for me.. I want to try out the southwestern grilled lamb. It look delicious. Such a long time I did not eat at Chili's . I know they offer affordable lunch. It's been a while since I visit Chilis! Food wise definitely has change a lot and comes with more varieties of food too. Oh my, that burger is so tempting. Looks delicious and your camera captures the details. Tak pernah try makanan di Chili's ni. Hopefully, i can go and try all food soon. omg! the menus are so tempting! I have always love Chilli's. It is a great place to hangout with great friends and good food. wahhh good info. thank you sharing. yummy. I don't remember the last time I went there..haha..but I always remember their great bottomless Nacho's..
maigodddd. semua makanan dia look delicious! mesti kena cuba salah satu ni. harga pon sangat ok tak terlalu mahal. OMG the chipotle prawn fresh mex looks so delicious. I haven't tried that one yet! Chilis ada menu baru ke? Chilli's is opening at sunway velocity soon! its near to my office so I would definitely go there for lunch or dinner later. yummy grilled lamb. i'm drooling.